As innovative technological solutions continue to shake up logistics, managing the supply chain is no longer business as usual.Recent surveys reflect “an incredible increase” in the number of supply chain business leaders who identify technology as crucial to strategy, according to Pierfrancesco Manenti, vice president of research at London-based SCM World. These leaders no longer view technology as a tool, but as a critical driver, affecting every level of business decision-making. This development is primed to grow stronger in the coming years. In fact, as the supply chain field more comfortably adopts vanguard technological solutions, it seems poised to experience wholesale alterations to the way it does business. “Logistics currently is ripe for technology-driven disruption,” says Greg Hewitt, CEO of DHL Express U.S., which provides door-to-door transport of international express documents and goods to and from 220 countries and territories. In the whirlwind of technological advances, however, it is easy to lose sight of where the value lies. Innovation is about much more than cleverness and breakthroughs, notes Doug Waggoner, CEO of Echo Global Logistics, a Chicago-based provider of technology-enabled transportation and supply chain management services. There has to be purpose and strategic design—actual usefulness—for the technology to take hold and influence business strategy. Here’s a look at six primary categories of emerging technologies that supply chain executives cite as most likely to prove widely disruptive in the coming years. In general, “logistics and transportation tend to lag behind other sectors in technological innovation,” Waggoner says. Today, however, that sector is chasing the possibilities of predictive analytics en masse. “If I was going to college now, I’d study to be a data scientist,” notes Neil Hampshire, senior vice president and chief information officer of ModusLink, a Waltham, Mass.-based provider of supply chain management services to global technology and software companies. That’s where the Internet of Things (IoT) comes in. IoT is a network of physical objects that are technologically enabled to collect and exchange data, allowing for groundbreaking access to real-time information. “IoT is arguably the most disruptive technology in the supply chain right now,” Hampshire says. Hewitt agrees. “Unlike some other trends, IoT has the potential to transform not just one specific area of logistics, but the end-to-end supply chain,” he says. “It will continue to drive unprecedented visibility into operations, and influence logistics decision-making on how goods are produced, stored, monitored, routed, transported, and delivered to customers. 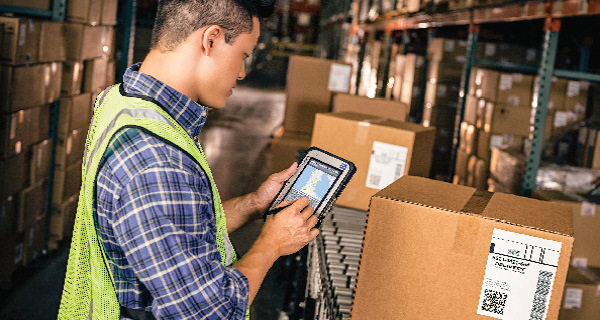 In the warehouse, IoT allows companies to track and manage inventory through the use of mobile devices. Developments in IoT appear to be leading toward “hands-free supply replenishment,” Hampshire says, right to the door of consumers as companies increasingly track their customers’ needs. The possible result is that one day, certain products will not have retail inventory as a “massive buffer” between production and consumption, he adds. Companies also will have more granular insights into how consumers use their products. For instance, imagine a coffee company that can track consumption of its flavors in real time in any given region, gaining invaluable analytics for marketing and inventory management, says Murt O’Donnell, director of eSolutions at ModusLink. IoT also allows companies to remotely manage products in previously unthinkable ways. For instance, with the aid of IoT, the aerospace and automotive industries can remotely control engines, monitoring their consumption and condition, and organize repairs and even upgrades to optimize the supply chain, Manenti says. “I expect that over the next five to 10 years, these technologies and approaches to remote-controlled products, as well as remote-controlled supply chains, will grow increasingly more common across industries,” he adds. During a recent trip to the dentist, Waggoner needed a crown. In the past, he would have had to schedule another appointment to allow time for a physical mold to be sent to an off-site lab, where the crown would be manufactured. This time, however, Waggoner waited a few minutes for a 3-D printer in the office to produce his new crown. For Waggoner, this experience illustrated the straightforward, but impressive, possibilities of 3-D printing—and its potential impact on logistics. “In the future, manufacturers will be able to print many products, once they receive the data,” he says. The complexity and personalization of 3-D printing could dramatically simplify previously complicated supply chains. For instance, Manenti notes, GE is currently creating 3-D printed fuel nozzles for jets, and plans to mass-produce them. The nozzles are composed of more than 40 components. Previously, producing the nozzles required an extensive supply chain. Today, however, the complete manufacturing process involves one production phase, based in a single factory. News headlines continue to spread the word about self-driving vehicles, often emphasizing the potential for passenger cars to gain mass traction. Supply chain and logistics professionals, however, are considering the ways this new technology could dramatically alter their operations. Driverless trucks have the potential to reduce labor costs and increase efficiency—after all, a driverless truck can travel straight to its destination without breaks for sleep and food. And self-driving vehicles could also be used to transport items inside warehouses and other facilities. Even with the introduction and refinement of self-driving vehicle technology, how it will be implemented is still an open question. For instance, will governing authorities require driverless vehicles to have a driver on board in case something goes awry? The ongoing commercial driver shortage appears certain to intensify in the near future, especially if the economy improves. Waggoner cites the possibility of the United States being 175,000 drivers short of demand in a few years. This shortage will likely play a major role in debates over the viability of driverless vehicles. No matter the obstacles, supply chain executives see the move to self-driving vehicles as inevitable—a matter of when, not if. Collaborative robotics appears to be having a breakthrough, as innovations continue to lead to the adoption of more agile, lightweight robots than the bulkier robots popular in manufacturing to date. Through the use of artificial intelligence and sensors, these new robots can work side by side with people, and even learn through experience so they do not need to be programmed in the traditional way. These robots also can recognize shapes, and perform automated tasks they could not handle previously, such as gluing, using a screwdriver, and selecting objects, Manenti says. Deutsche Post DHL Group recently tested the implementation of robotics in logistics operations and found the results promising. “In the future, companies could adopt robotics to work alongside humans at tasks such as unloading trucks, co-packing, picking orders, checking inventory, or shipping goods—all with a high degree of accuracy,” Hewitt says. New leaps forward in technology will not be the only way that technology influences the supply chain in the coming years. Just as influential will be the innovative ways that people use existing technology to develop new approaches. Roadie, an app-based service that networks deliveries to individual “civilian” drivers, fits that bill. Marc Gorlin, Roadie’s founder and CEO, spoke in April 2016 at the Georgia Logistics Summit about how technological advances are producing new spaces for innovative logistics companies to operate in ways they had never considered before. In addition, the “Uberization” of delivery is currently a particularly compelling space as innovative startups look for ways to provide same-day service at costs competitive with traditional carriers. Kewill has been incorporating Deliv—which works with online and physical retailers to provide same-day deliveries through its network of drivers—into its software solutions, says Surrett. Deliv is an example of an enterprising organization solving what isn’t a technological problem but a “look at the world problem,” Surrett says, figuring out how to make single-shipment, same-day deliveries financially feasible for both business and individual customers. Similarly, Gorlin is tapping into an existing network with the Roadie app. People post their delivery needs through the app. Drivers who sign up with Roadie learn when posted jobs fit their travel route. The result can be some unusually fast deliveries. In one instance, a man purchased a 10-foot rug at a store, then realized when he got in line to pay that he would not be able to fit the rug into his two-seat car. He put out a request on Roadie. By the time he reached the cash register, he’d received a bid to handle the delivery. The rug was picked up soon after. In just about one year, Roadie has established a network of more than 20,000 drivers in every U.S. state. Will companies use Roadie? So far, small businesses enlist Roadie like a courier service, using it for deliveries of items ranging from flowers and baked goods to chandeliers. In 2015, the Federal Aviation Administration introduced Exemption 333, which lifted the prohibition on flying drones for commercial purposes. Since then, “there has been massive growth in the drone industry, and several millions of dollars are being invested,” says Lawrence Corban, co-founder of Guided Systems Technologies, a Stockbridge, Ga.-based provider of turnkey helicopter unmanned aerial vehicles and systems. Guided Systems Technologies has been involved in developing drone technology and applications for years with the Department of Defense. Now, the company is exploring opportunities in private industry. Corban has designed a system that he says removes many of the primary obstacles to the widespread use of drones. His system uses a large fuel-powered aircraft that carries smaller, short-range electric aircraft within range of their delivery addresses. The aircraft can carry large quantities of cargo or smaller drones to an area and dispense them with their deliveries, solving the inefficiencies of a single drone traveling a long distance to deliver one package. Corban designed the system with developing countries in mind, particularly those with remote villages difficult to reach because of unpaved roads that are occasionally impassable. The ongoing push to improve internet connectivity in these remote parts of the world will not spark economic growth without improved physical access, he notes. Currently, it is difficult to make the financial models for drone delivery work, Corban says. Companies must invest large amounts of money to develop products and services that are affordable to customers. Once they achieve that, “the margins are not great,” he says. Still, Corban says, it is only a matter of time before the commercial drone industry overcomes those issues and spreads its wings—in the United States and the rest of the world. “By 2020, drones will be integral to everyday life,” he says.